A Galway woman’s decision to run her first VHI Women’s Mini Marathon paid off in more ways than one when she collected the keys to a brand new Nissan Note. Niamh Madden from Galway City won the car after her name was drawn from the list of over 40,000 participants in the race, which Nissan supports as official car sponsor. Niamh Madden, from Galway City and her daughter Beibhinn (6) collect their new Nissan Note from Michael Connell, Sales Executive, Windsor Galway Nissan. “I’m thrilled. We needed a new family car and it couldn’t have come at a better time,” said Niamh who completed the VHI Mini Marathon in a time of 1 hour 10 minutes. “I ran the race to raise funds for the Asthma Society of Ireland. It was my first time to run it. Finishing it and winning the car was a great result all round,” said Niamh, who waited until this week to collect her new 162 registered Nissan Note from Windsor Galway Nissan. “The car is very eye-catching. I loved the one on display at the marathon so I stuck with the colour red. It is going to be a new car for myself and our two kids Beibhinn (6) and Donnacha (4). We just did our first long drive to Ennis and it had plenty of room,” added Niamh. Nissan is a long-standing car sponsor of the Women’s Mini Marathon. Every entrant to the event was automatically entered into the draw to win the elegant and spacious new Nissan Note which is packed with smart technology. Niamh was one of three entrants drawn by the organisers on the day. All three received a gift of Newbridge Silverware but the real surprise was reserved for Niamh who was named as the winner of the new Nissan Note which was also on display at the race finishing line in Dublin. 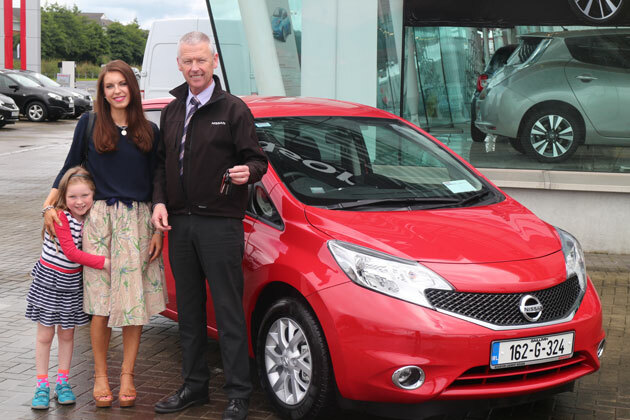 “Nissan are delighted to congratulate Niamh on winning the Nissan Note and on finishing her first VHI Women’s Mini Marathon. We look forward to seeing her back at next year’s event and wish her many years of happy motoring as a new Nissan driver,” said Jeanne McGann, Head of Marketing at Nissan Ireland.